If you haven’t been bombarded by the media or somebody on Facebook raving about the miraculous, all-healing powers of coconut oil, you’ve either been living under a rock or you’re really, really good at blocking people from college (and your mom) on social media. But not everyone buys into the idea that coconut oil is a panacea sent straight from the heavens, even those in the health world. 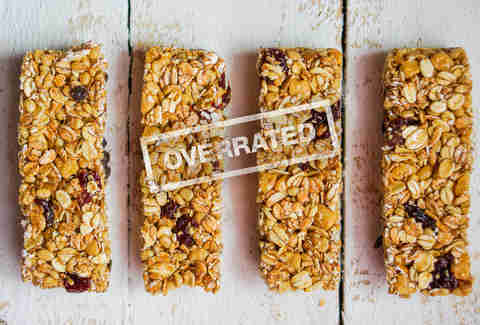 So which “superfoods” do nutritionists think get more hype than they deserve? Gasp! 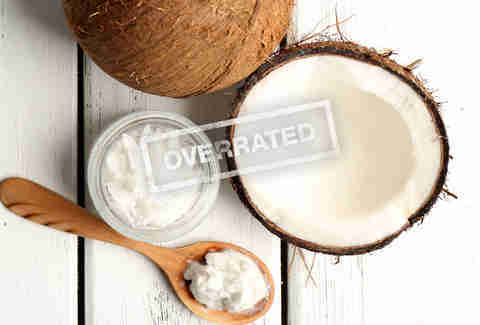 Bedwell points out that, though it’s touted as a “healthy” oil, coconut oil is actually high in saturated fat. While some claim that the fats in coconut oil are medium-chain triglycerides, making the overall product less damaging than other forms of saturated fats, Bedwell says there’s no significant research to back up this claim. She recommends using canola oil instead, which is the lowest in saturated fat of all common cooking oils. If you’re one of those people who only asks for egg whites in their omelet, maybe it’s time you live a little. Yolks used to be removed because of their cholesterol, but that’s old science, Wiss promises. Losing the yolk means losing optimum nutritional benefits from eggs. Egg yolks contain all of the fat-soluble vitamins (like vitamins A, D, E, and K) as well as other nutrients, like choline. If you’ve ever wondered just why granola makes your sucky yogurt taste incredible, it’s because the seemingly healthy food is actually loaded with calories and fats from added oils (you know -- the ones that make it taste so good!). And we haven’t even factored the sugar in yet! Unless you eat a very small amount or make it yourself, granola can be a real damage to your diet. Largeman-Roth thinks that kombucha is really just a fancily named drink with close to the same digestive benefits as yogurt -- like probiotics for your gut. It doesn’t help that it comes with a hefty (and unwarranted) price tag. 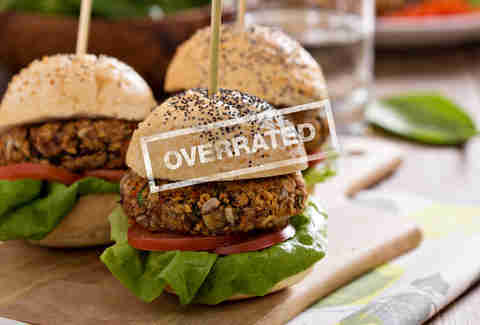 If you’re looking to substitute your bacon burger for a veggie option, know this: many commercial veggie burgers are so heavily processed, you’re better off reaching for a fresh meat or fish-based burger. Shorenstein recommends reading the ingredients list, and selecting minimally processed burgers, or make your own if you’re trying to reduce your meat intake. Chamberlin warns against labels that tout “healthier” benefits without the nutrition facts to back them up -- like chips that have been baked instead of fried. Many times, baked chips have the same amount of calories as the greasy kind. Plus, they often have just as much sodium and carbohydrates, and a decent amount of fat. 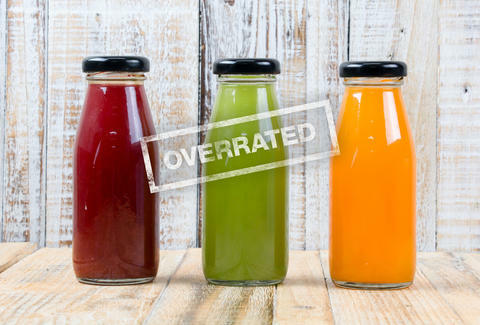 Most juices are billed as healthy because they’ve got minerals, antioxidants, and are made from real fruits and veggies, Chamberlin says. The problem is that they’re also loaded with calories because of their high sugar content. Juices are also missing what helps make fruit good for you: fiber! Chamberlin recommends sticking with actual fruit. 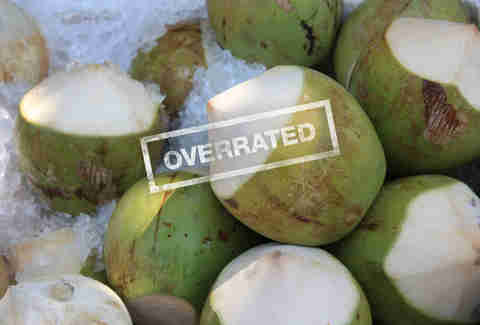 While it may be a miracle hangover cure, commercial coconut water probably isn’t doing your health any favors. Since most commercial coconut water is pasteurized, essential micronutrients are killed off in the process, turning the beverage into glorified sugar water. The only coconut water Mizokami recommends is a raw and unpasteurized kind. Think picking up veggie chips over the potato versions in the snack aisle will give you an edge in the health department? Wrong. Most varieties are potato-based with added vegetable powder, making them nutritionally equal to regular potato chips, Foti says. They’re also high in fat and calories, low in fiber, and don’t provide the same nutritional benefits, like vitamins and minerals, found in whole sources of vegetables. Instead, Foti suggests reaching for snacks that use the whole vegetable -- like dried edamame, chickpeas, or green beans. Though they’re perfectly portioned, 100-calorie packs aren’t as good as more nutritionally dense options, in Foti’s mind. She recommends hummus (the kind you make at home, of course) and carrots. For an extra 50 calories, the combination has more fiber and protein to hold you over until your next meal. 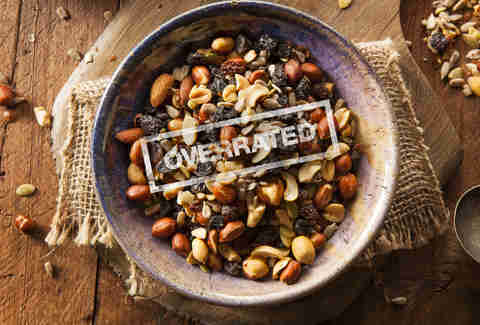 Most store-bought trail mixes contain tons of hidden sugars, fats, and extra calories that can take away from many of the supposed health benefits, Tanzer says. He recommends making your own version with various nuts, seeds, dark chocolate, coconut, and berries. Sorry, but most of the yogurt you find at your local grocery store is more of a dessert than a snack. That’s why Tanzer urges you to seek out plain Greek yogurt (not fat-free or low-fat, just plain Greek yogurt) and add in your own fruit for a healthier choice. These drinks may be refreshing and contain a variety of added vitamins and minerals, but they also contain lots of added sugars (duh, that’s why they’re so good!). Enke points out that most of these beverages are sold in bottles larger than the standard 8oz serving size, tricking people into consuming the entire bottle at once, leading to an overload of sugar and calories. This low-glycemic-index sweetener is commonly recommended to people with diabetes. But Enke warns that it’s still a refined, processed sugar that resembles high-fructose corn syrup. Consume this sweetener in small amounts, if you have to consume it at all. Erin Kelly is a writer, marathoner, and triathlete living in New York City. She’s reconsidering her granola habit these days. Follow her on Twitter at @erinkellysays.